Let’s just jump straight to dessert. Back when I baked the oatmeal maple bars from the Greyston Bakery Cookbook , I mentioned that the mocha kahlua cake from that book might be nice for dessert on Christmas Eve. Well, it most certainly was. 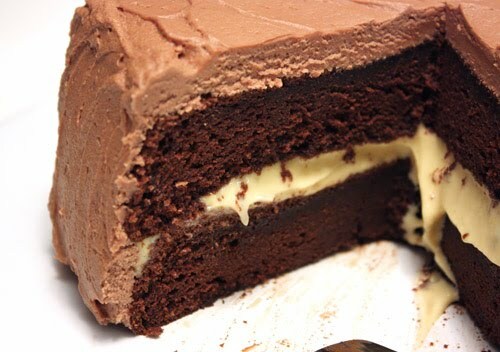 This is a cake of rich, chocolate layers with a kahlua custard between them, and it’s topped with a mocha buttercream frosting. If you follow the instructions exactly, you’ll have a very grand cake that’s three layers tall. I went for a slightly less grand final version of only two layers, and I baked the remaining layer’s worth of batter into cupcakes which are in the freezer now. I made the full amount of custard and the extra bit intended for a second layer of filling became a nice, little snack. I also made the full amount of frosting and gave the top of the cake a thick coating. The cake batter was made with cocoa powder and espresso powder and six separated eggs plus two additional egg whites. The whites were beaten into soft peaks and carefully folded into the batter. After the cakes came out of the oven, they were brushed with kahlua which added flavor and kept them moist. As the cakes cooled, the custard was made with the two remaining egg yolks, sugar, cornstarch, half-and-half, and kahlua. I tasted it several times as it thickened to be sure it was as delicious as I thought it was. It was. The custard was chilled and then layered between cakes, and then the stacked layers were chilled for about an hour. Last, the buttercream was made with, of course, butter, cocoa powder, more kahlua, confectioner’s sugar, and half-and-half. It was a thick and sturdy frosting with just enough chocolate flavor. The finished cake does need to remain in the refrigerator, and I just barely had space for it. OMG! That cake is sinful! WOW! This isnt helping...looks too good! 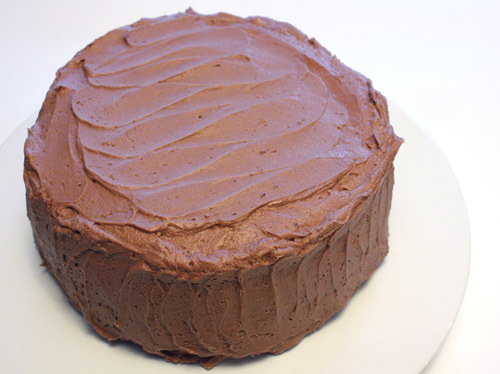 I am in a chocolate cake phase...might have to make, eat one piece and give the rest away! happy baking! 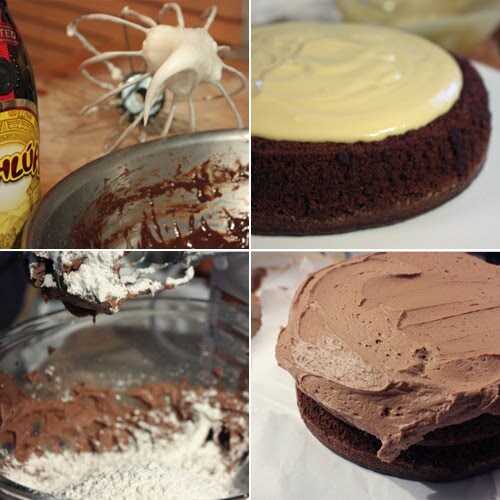 Moist chocolate cake with kahlua frosting....what a sinful indulgence! I love mocha and I love kahlua, so I must love this cake, Happy New Year Lisa! Why bother with dinner - dessert first - life is too short. And that is one fine dessert. the cake looks so rich and moist. That is a nice, rich cake! That looks absolutely decadent! Must try this one. What a stunning looking cake. The texture looks so moist and yummy. I wish I could have some. Wishing you a very happy 2010. A gorgeous cake! It must taste heavenly! Wonderful! This cake looks and sounds de-lish. I can't wait to try it. Love your blog. Thanks for sharing!!! I bought my sister in law (who is the baker) the Greyston Bakery book, and I have requested that she make this cake! I sent her your post! Ummm...Where's my slice???? That looks so mouthwatering right now. I'll skip my lunch and head straight for dessert. Oh my..that's one great looking cake! The layers are so mouthwaterin esp the custard! Wow. Just wow. Great job, Lisa! I wish my coffee-hating husband had chosen this cake for his birthday instead of the scotch-whiskey I have on my to-do list to finish today. I can take or leave Scotch, but I do love Kahlua (and of course, chocolate.) Happy New Year to you! Can't wait to see what you have up your sleeve in 2010! Oh My gosh! If I was near by I would come over uninvited. Splendid flavors and it looks gorgeous. WOW! This is some cake! 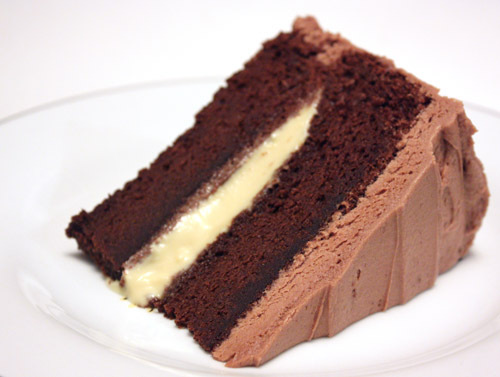 Man, look at how moist, dark, and chocolaty the cake is. Not sure if I would have patience to frost it before digging in. OMG! I think I died and went to heaven. This is so awesome-a Chocoholic's dream. What a decadent cake! It looks absolutely delicious! Those cupcakes will be a nice little treat later on. If I hadn't just committed to a healthy challenge, I would be making this in a heartbeat. It looks mouth watering. I love the chocolate and coffee flavors that make the chocolate taste even more chocolatey. fact: i would discard almost anything in my fridge in order to get this beauty a spot in there--wowza! i LOVE your lusciously thick layer of frosting, and the filling looks quite plentiful too. that's not to say that i wouldn't enjoy the cake portion, too, because i would. it's just one happy combination, lisa--bravo! Don't you just love chocolate and coffee together? Your cake is divine. No other word for it! Happy New Year to you, Lisa! Waw,...Lisa!! A georgous & ooh so decadent filled cake!! I love your layers!! Happy New Year to you and your family Lisa. May this year bring lots of happiness. Gorgeous and mouth watering looking cake. Whoa! Right off the start you are going to challenge all my new year resolutions, but I have to say, if you are going to struggle - what a way to go! Happy New Year - this is kicking it off with a bang. OMG Lisa! Saw the picture of this on Refrigerator Soup and was praying that whoever made this divine confection was a friend of mine! Yay! I'm on my knees begging for a slice of this...please? This is like a White Russian in cake form. How decadent! I love Kahlua so I'm definitely going to have to try this. I bet it would be great with any of those types of cream liqueurs, too, don't you think? Yum! OMG that look wonderful! I'm not much of a sweets person, but this looks GOOD! Oh i could KILL for this one!!!! WOW! can i pleeeeease have a slice? Ah! I just go crazy every time I come over here Lisa...I would just dive into this if I had it in front of me right now, oh yes I would! Whoa, that's flavor packed! Whoever ate this cake was lucky. That custard oozing out of the center is arrestingly beautiful. If I were walking down the street and saw that in a shop window I would have definitely done a double take. this looks incredible. i cannot wait to try this recipe! thanks! !